The global MRI systems market size is projected to grow at a CAGR of more than 5%, or by almost USD 1.58 billion, during the forecast period 2019-2023, driven primarily by technological advances. Siemens Healthineers (Erlangen, Alemania) ha establecido una asociación estratégica con el proveedor australiano de atención médica integrada, Primary Health Care, para instalar más de 70 analizadores de inmunoanálisis y química clínica Atellica Solution, lo que marca el mayor contrato para pruebas diagnósticas in vitro en el país. Siemens Healthineers has entered into a strategic partnership with Australian integrated healthcare provider Primary Health Care to deploy more than 70 Atellica Solution immunoassay and clinical chemistry analyzers, marking the largest contract ever for in vitro diagnostics testing in the country. Siemens Healthineers and ScreenPoint Medical have entered into a partnership to develop artificial intelligence (AI)-based applications for breast imaging. As part of the arrangement, Siemens Healthineers will also acquire a strategic minority stake in ScreenPoint Medical. 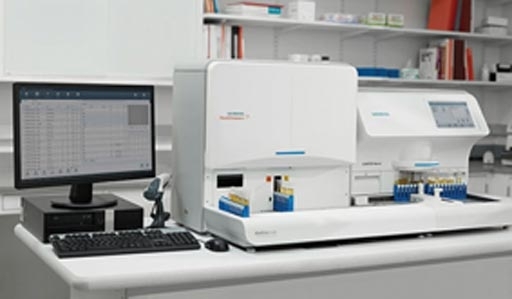 Siemens Healthineers launched a new molecular thermocycler, the Fast Track cycler (FTC), and the complementary new FastFinder software at the 28th European Congress of Clinical Microbiology and Infectious Diseases (ECCMID 2018). The compact FTC allows laboratories of all sizes to implement molecular testing with simplicity and speed, while the FastFinder software improves workflow using Artificial Intelligence (AI)-powered automation. Global technology powerhouse Siemens AG and its separately managed healthcare business, Siemens Healthineers have announce that the planned IPO of Siemens Healthineers AG is expected to be completed in the first half of calendar year 2018, subject to capital market conditions. Siemens Healthineers has laid out its strategy to bolster its market leadership by 2025 and beyond, aimed at accelerating profitable growth and delivering return. The company has stated that it is well prepared to take advantage of the paradigm shift and structural growth opportunities in healthcare. Siemens Healthineers has entered into an agreement to acquire Fast Track Diagnostics, which supplies diagnostics tests that can distinguish between viral, bacterial, or other infections in one test. Siemens AG, a provider of medical imaging and laboratory diagnostics equipment, is preparing to list its separately managed healthcare unit, Siemens Healthineers, on the Prime Standard segment of the Frankfurt Stock Exchange's Regulated Market. The move was approved at a meeting by the company's Supervisory Board and has been planned for the first half of 2018. Siemens Healthineers AG will be established for the public listing. Siemens Healthineers, the separately managed healthcare business of Siemens AG, has completed the acquisition of Epocal Inc., a subsidiary of Alere Inc. that develops and provides point-of-care (POC) blood diagnostic systems for healthcare enterprises. Siemens Healthineers and HORIBA Medical have entered into a long-term agreement to bring new and innovative hematology solutions to the market globally. Siemens Healthineers, the separately managed healthcare business of Siemens AG, has entered into a definitive agreement to acquire Epocal Inc., a subsidiary of Alere Inc. that develops and provides point-of-care (POC) blood diagnostic systems for healthcare enterprises. The Universitätsklinikum Erlangen, Siemens Healthineers (Erlangen, Germany), the Friedrich-Alexander-Universität-Erlangen-Nürnberg (FAU), the Fraunhofer Institute for Integrated Circuits (IIS), and Medical Valley EMN have entered into an alliance to establish the Digital Health Innovation Platform (d.hip) with the aim of driving digitalization in medicine and healthcare. Siemens Healthineers, the separately managed healthcare business of Siemens AG, has entered into a new strategic relationship with Fast-track Diagnostics for the addition of FTD’s broad range of CE-marked kits and multi-syndromic panels to the menu of Siemens Healthineers’ VERSANT kPCR Molecular System. This will allow Siemens Healthineers to provide its customers with expanded, more comprehensive molecular testing solutions. Siemens Healthineers has signed an agreement to acquire Medicalis Corporation with the aim of expanding its Population Health Management (PHM) portfolio. Siemens Healthineers has partnered with Ebit Srl-Esaote Group, dedicated to healthcare IT, to resell Ebit’s Suitestensa cardiovascular information system (CVIS) as an option with all its cardiology systems throughout Germany. Siemens Healthineers announced a digital platform for healthcare providers as well as for providers of solutions and services, at the Health IT Conference (HIMSS) 2017 in Orlando. The platform, covering the entire spectrum of healthcare, is meant to foster the growth of a digital ecosystem that links healthcare providers and solution providers with each other, as well as brings together their data, applications and services. Siemens Healthineers has entered into a five-year contract to take over the clinical laboratory service operations for two new hospitals in Turkey. The hospitals in Bilkent, Ankara, and in Mersin are being built and operated as Public Private Partnership (PPP) by DiA Construction, a subsidiary of DiA, for the Turkish Ministry of Health. Siemens Healthineers and Biogen will jointly develop magnetic resonance imaging (MRI) applications for quantifying key markers of multiple sclerosis (MS) disease activity and progression. Siemens Healthineers has announced that it will invest around USD 300 million over a four-year period for expanding its laboratory diagnostics manufacturing and research and development facility located in Walpole, Massachusetts in the US. Siemens AG, Europe’s largest industrial conglomerate, has announced that its USD 15 billion healthcare division, which operates under the uniform brand name Siemens Healthineers, will be publicly listed as an independent medical technology business. Siemens Healthineers, which offers products and services in imaging for diagnostic and therapeutic purposes as well as in laboratory diagnostics and molecular medicine, has acquired Conworx Technology GmbH, a developer of point-of-care device interfaces and data management solutions. Siemens Healthineers and Conworx will deliver open connectivity offerings that will enable seamless data integration from any manufacturer’s point-of-care analyzer – managed by a single informatics solution to streamline operations and access to data, and improve risk management. The Atellica 1500 combines the CLINITEK Novus and the Atellica UAS 800 into one automated unit for the highest accuracy and efficiency. It allows more samples to be managed using less staff in a shorter time, and streamlines detection of UTIs and early kidney disease.